If you are looking for electronic manufacturing services in Toronto then you may become overwhelmed by the number of options at your disposal. Your decision may become more difficult because most, if not all of the electronic manufacturing services that you come across claim to offer unrivalled, industry-leading service. 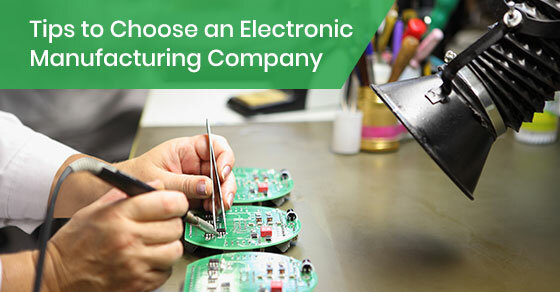 However, there is more than meets the eye, and the purpose of this article is to provide you with some handy tips to help you decide on which electronic manufacturing company to partner with. The first thing you should consider is the amount of experience that the company has in manufacturing electronic components in your respective industry. Well-established enterprises that have been around for several years or decades are far more likely to provide a high-quality service that is devoid of defects or other such issues. Do not hesitate to ask the company you are thinking of partnering with how many years of experience they have in manufacturing electronic components and other related hardware, and it also wouldn’t hurt to ask them what their hiring process is to help better gauge their quality control methods. What are their design capabilities? Simply providing electronic manufacturing services should not suffice when it comes to selecting the best company for the job. The best electronic manufacturing companies will also help you throughout the design process, from the initial phase to the finalized product. In some instances, you may opt to begin from scratch while in other cases you may simply want a different perspective or require an unbiased third party to review your technical specifications. In any event, the company that you select should be able to help you streamline your design capabilities in order to maximize their effectiveness as well as their efficiency. Moreover, you should also consider the types of equipment, machinery, and tools that the company uses. In other words, if the company does not utilize state of the art, industry-leading tools, equipment, and machinery to manufacture its electronic components then you should partner with a company that does. In the end, the electronic manufacturing industry is highly competitive and in a state of perpetual flux, so you will need to hire a company that has innovative ideas and that utilizes cutting edge technology in order for them to manufacture components that will ensure that your company remains competitive in the market. Do they follow industry compliance protocols? If the companies you are in talks with do not adhere to the most up to date industry standards then they should be avoided at all costs. In fact, not only should they comply with all of the industry regulations and rules for electronic component manufacturing and design, but they must also adhere to your company’s specific production standards in order to be a viable and reliable partner. In an increasingly green tech-space, businesses need to adapt their manufacturing processes or be rendered obsolete. The company that you hire must be environmentally conscious in all of its business practices. Ask each prospective company if they are compliant with Restriction of Hazardous Substances legislation, and if they would also be willing to convert any of your company’s board unique designs to a Restriction of Hazardous Substances compliant system. By doing so, not only will you help do your part to reduce pollution and waste but you will also help improve your company’s corporate image and reputation with your clients and potential customers. Run of the mill electronic manufacturing companies will usually be satisfied with simply manufacturing a batch of PC boards and then calling it a day. However, the best electronic manufacturing companies will conduct meticulous testing to ensure that each component is fully operational and performs according to design specifications and expectations. Ask the company what their testing methodologies are comprised of in order to ascertain how they analyze, detect, and rectify design issues and flaws. By troubleshooting in order to ensure that their components are up to par, an electronic manufacturing company will be able to detect marked production issues quickly and save you significant amounts of time and money. Moreover, testing products thoroughly will allow your company to analyze trends so that you can become a forward-thinking and proactive company that is always one step ahead of its competitors. It is important to note that not all supply chain solutions will work equally well, if at all, with every company in the industry. So the company you hire must be able to provide you with multiple commodity and component sourcing agreements from around the world. They must also be willing to adhere to your specific requirements regarding sourcing restrictions, preferred vendors, and your contract requirements. What are their fulfillment services? Finally, the company that you choose must also take care of your post-production requirements. For instance, they should provide fulfillment services which include troubleshooting for defective boards, and they must handle all of the required repair work before returning them from their facility. By doing so, they will save your enterprise money and time that would have otherwise been expended on warranty replacement components and/or manpower. To learn more about choosing the right superlative electronic manufacturer, call Circuits Central at 888-821-7746 or contact us here.